Our second place farmer this year was Angus Gowthorpe, who farms 400 acres in York with a mix of arable crops and grassland for his pedigree cattle. Angus manages a massive variety of soil types from blow away sand to heavy clay and has completely changed the focus of his management to concentrate on soil health to benefit the business and the next generation as well as the wider environment. Angus moved away from tillage 5 years ago, achieving the transition by 3 years of strip till, and for the last two years following a no till system. As well as eliminating tillage, Angus has been using cover crops, including grassland in the rotation and made the most of residues, alll with the aim of improving soil management, health and structure. He is starting to see the soil structure improve, especially on his heavy land. "Soil is so important and at the centre of everything we do now. Crops are healthier, meaning we can use less inputs, we have more wildlife around the farm and margins have improved." The first crop that the group looked at was some wheat which had followed linseed. Along with discussions on the benefits in terms of input reductions that can come with a transition to a no-till system, there was a good sharing of experiences of the use of cover crops, as this field had had a cover crop prior to the linseed. Angus explained the process that he had gone through over the last three years of using cover crops; starting out using a basic mix of oats, phacelia and buckwheat, gradually adding other species including sunflowers, peas, millet and vetches to create a diverse mix. This cover crop was grazed by sheep and the benefits of grazing cover crops including the addition of beneficial biology through manure deposits to turbo charge the soil was discussed. While talking about livestock, Angus explained about the cattle and the wish to move towards a mob grazing system in the future to further improve soil health. Following a look at the wheat, the group then moved on to look at a field of barley and talked about weed control, drainage, whether or not to apply gypsum and muck as well as the benefits of reduced tillage systems in the dry weather in terms of holding onto what little moisture was there. 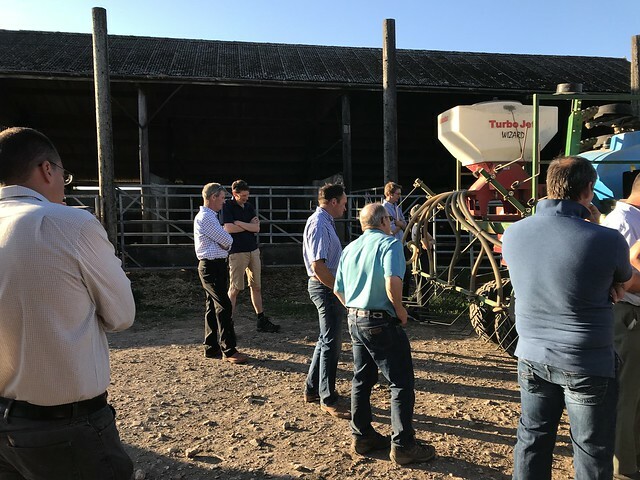 After another field of barley and more discussions about the importance of soil structure, drainage and encouraging the worms, the attendees gravitated towards the machinery and specifically Angus’ John Deere 750a. Questions around drill selection, adaptations, liquid fertiliser kits and different discs carried on for a long time along with ideas around how to take some of the ideas away and work on them at home. Angus has also done a write up of the event for BASE UK, which you can see here. A massive thank you to Angus and family for hosting a fantastic evening.